Railway station located in Kaohsiung, Taiwan. 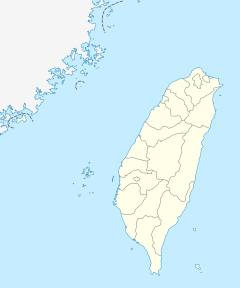 Sankuaicuo (Chinese: 三塊厝; pinyin: Sānkuàicuò) is a railway station in Sanmin District, Kaohsiung, Taiwan. The southern Taiwan railway project began near the beginning of Japanese rule in 1908. Sankuaicuo, the first station on the eastern spur of what is now the West Coast line, where a temporary station (臨時停車場) opened on 1 February of the same year. It was subsequently replaced by a then-permanent station building in 1923. During that time, the railway station contributed greatly to the local industry but became a third-class station (三等駅) with the opening of the new Kaohsiung (Takao) station in June 1941. Sankuaicuo was closed to passengers in 1962 due to falling passenger numbers, however goods handling continued at the station until it was finally closed on 26 September 1986. The permanent way between Sankuaicuo and Kaohsiung Port was removed between July 1990 and November 1995. On 9 September 2004, the Kaohsiung City Government designated the 1923 Sankuaicuo station building as a historical site. The station was rebuilt and re-opened on 14 October 2018 as part of the underground relocation of railway tracks in Kaohsiung. The station building was built with bricks, cement and mortar. It is covered with washed stone. Wikimedia Commons has media related to TRA Sankuaicuo Station. ^ "各站營業里程-1.西部幹線". Taiwan Railways Administration (in Chinese). 11 December 2008. Retrieved 13 October 2018. ^ "Sankuaicuo Railroad Station". Cultural Heritage Kaohsiung. Bureau of Cultural Affairs Kaohsiung City Government. 2008.